How big is Germany? What is the highest mountain? How many people live in the country? What is the weather like? Read on and get the answers to all these questions. Discover interesting, serious, funny and strange facts about Germany. Germany is in central Europe, and a member of the European Union. The official name is Federal Republic of Germany (Bundesrepublik Deutschland). Map of Germany: Copyright World Sites Atlas (sitesatlas.com). All rights reserved. Germany shares its boundaries with Denmark in the north, Poland and the Czech Republic in the east, Austria and Switzerland in the south and the Netherlands, Belgium, Luxemburg and France in the west. The longest common border is with Austria, 784 km (487 mi). The German Wasserhäuschen - This Frankfurt icon has to be on my list of facts about Germany. After all, I have been living close to Frankfurt all my life. Known as kiosk and Trinkhalle outside of Hesse, Wasserhäuschens have been part of local character in and around Frankfurt for many years. Frankfurt is also well-known for its apple wine culture. See my Frankfurt attractions page, and watch a video about apple wine traditions. 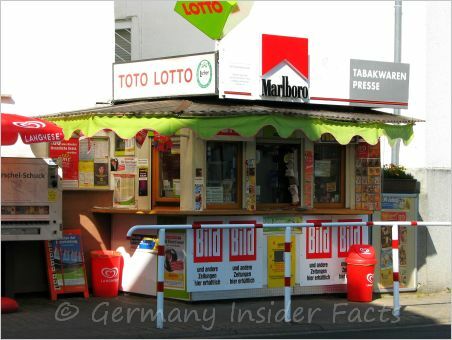 When the weather is nice, Germans love to sit outside, enjoying lunch, dinner, or just a drink. 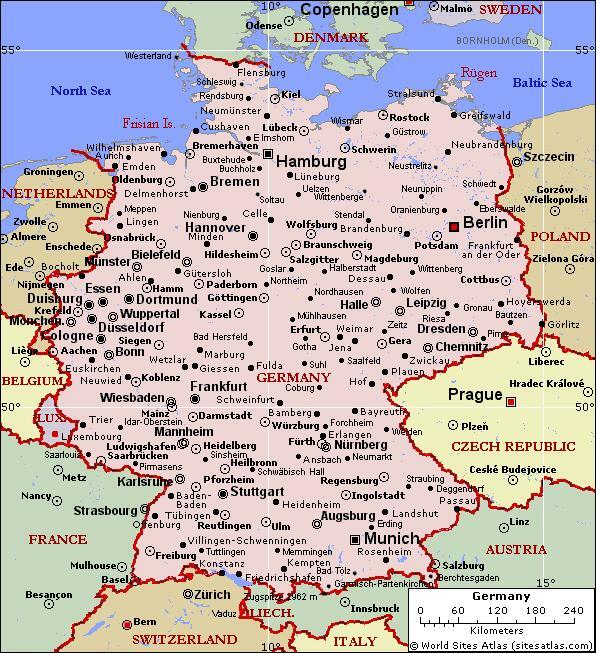 Size of Germany Since 1990, the year of the reunification, Germany covers 357,111 km² (137,881 sq miles). Population of Germany is approximately 82,500,000 (2016). About ten years ago, Germany had a declining growth. However, most recently birth rate grew and new arrivals seeking protection stopped the drop of population. About 11% of German citizens have an immigrant background, and about 12% are foreigners. The Flag of Germany has three equal horizontal bands which display the national colours of Germany, black, red and gold. The tricolour has been the flag of East and West Germany after WWII, although East Germany added its coat of arms in 1959. Since reunification in 1990, the tricolour has remained the German flag. The German coat of arms features a black eagle on golden ground. The use of the golden eagle as an emblem probably dates back to Charlemagne (742-814). Although the coat of arms changed very often in Germany's long history, the eagle has always been part of it. Time in Germany - Germany uses Central European Time ((Mitteleuropäische Zeit, MEZ), which is UTC+1, from the last Sunday in October until the last Sunday in March. On the last Sunday in March Central European Summer Time (Mitteleuropäische Sommerzeit, MESZ) begins. In Germany we call the Daylight saving time (UTC+2) simply summertime (Sommerzeit). German Currency - On 1 January 2002 the Euro replaced the German Mark (Deutsche Mark). The Euro is used in 16 of the 27 member states of the European Union. German states - Germany has 16 states (Bundesländer). Berlin, Hamburg and Bremen are so-called city states. Berlin is also the capital city. Highest Mountain - Zugspitze (2,962 metres / 9,718 ft) in the Bavarian Alps, close to the Austrian border. Largest Lake is Lake Constance in southern Baden-Württemberg, fondly named the Swabian Sea. Actually, Germany, Austria and Switzerland share Lake Constance, and there is no legally binding agreement about the national boundaries within the lake. Having a mild climate, Lake Constance is a favourite holiday destination in all three bordering countries. The tallest church is neither the cathedral in Cologne nor the one in Frankfurt. With a height of 161.53 metres (530 ft) and 768 steps to the top, the minster of Ulm is the tallest church in Germany, and in the world. Famous Germans - The list of famous people could go endlessly, so I can only list a few here. Germany is the land of remarkable scientists (Albert Einstein, Max Planck), famous composers (Johann Sebastian Bach, Ludwig van Beethoven), painters (Albrecht Dürer, Carl Spitzweg), writers (Johann Wolfgang von Goethe, Friedrich Schiller, the Manns), and philosophers. The Grimm Brothers are well-known for the fairy tales they collected and published, however, they were teachers and well acknowledged for their linguistic research. More recent famous Germans include fashion models Heidi Klum and Claudia Schiffer, sportspersons like Michael Schumacher, Boris Becker and Birgit Prinz. Worth to mention in this section is that "Ode to Joy", the Anthem of Europe, is based on Beethoven's 9th Symphony and the poem "To Joy" (An die Freude) by Friedrich Schiller. This is one of my favourite pieces of classical music. German beer - With more than 1000 breweries in Germany, it is no surprise that Germans belong to the biggest beer consumers in the world. Depending on the year and the statistics, Germany is always amongst the top three nations of beer drinkers, along with Ireland and the Czech republic. Favourite Sports - Despite Michael Schumacher and Boris Becker, football (soccer) is still the most popular sport in Germany. Hundred of thousands of football fans fill the stadiums every weekend, and even more watch the games on TV at home. Weather in Germany - Germans tend to complain about the weather all around the year. It is either too hot , or too cold , or too wet . Actually, Germany has a temperate climate with four distinctive seasons. The weather is often rather changeable, so it is hard to plan that garden party in advance. Related articles you will enjoy. 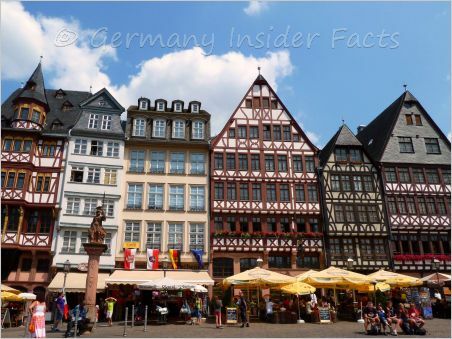 Discover more interesting facts about Germany.